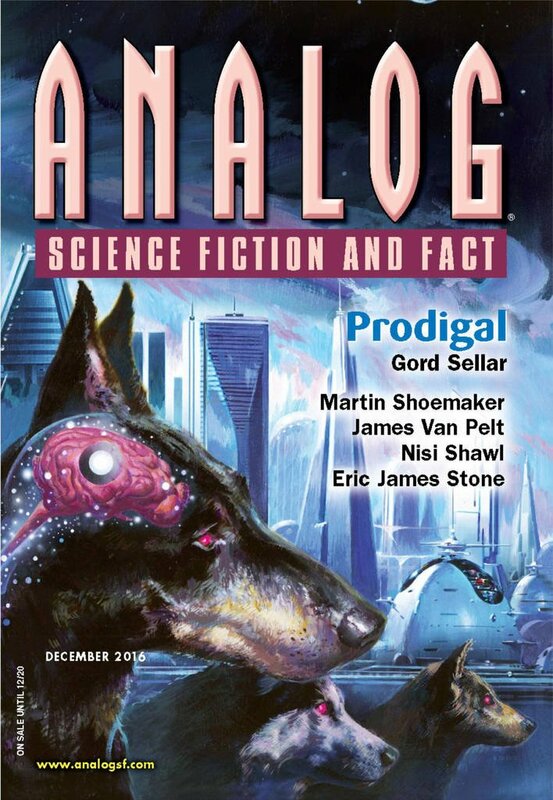 "Like the Deadly Hands," by Nisi Shawl [bio] (edited by Trevor Quachri), appeared in Analog Science Fiction and Fact issue 12|16, published on October 27, 2016 by Penny Publications. Pro: The prisoners are very clever in figuring out how to use the poisonous food to eliminate the trustees. Con: There's no one to root for in this story. Carpenter Marie comes the closest, but she's merely a victim here. It's hard to believe the AI wouldn't take some drastic action if all the trustees were to die, so it's difficult to see what benefit the prisoners get from killing them--other than the pleasure of seeing them die. Likewise, it's hard to believe that local plants wouldn't be properly analyzed to identify poisonous ones. This is a prison, after all.